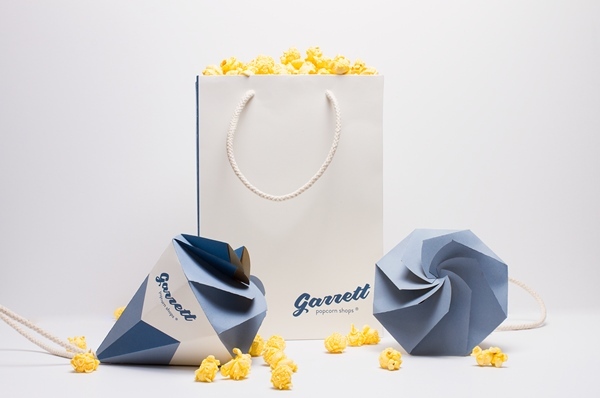 This cool cone popcorn packaging design was made as a student project for The Garrett Popcorn shops in Chicago, check it out. 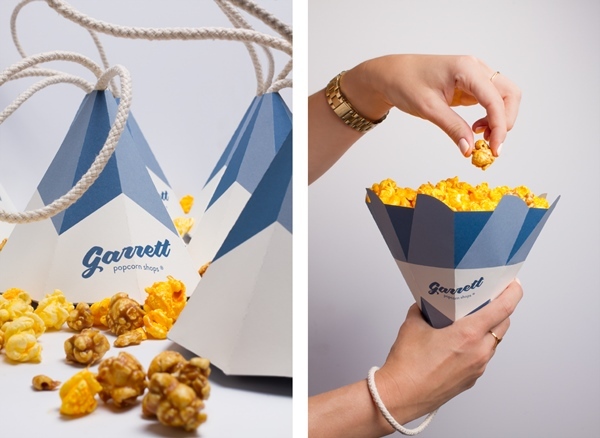 This cool cone popcorn packaging totally makes sense when you see it. But for some reason you rarely see shapes like this when you buy popcorn. 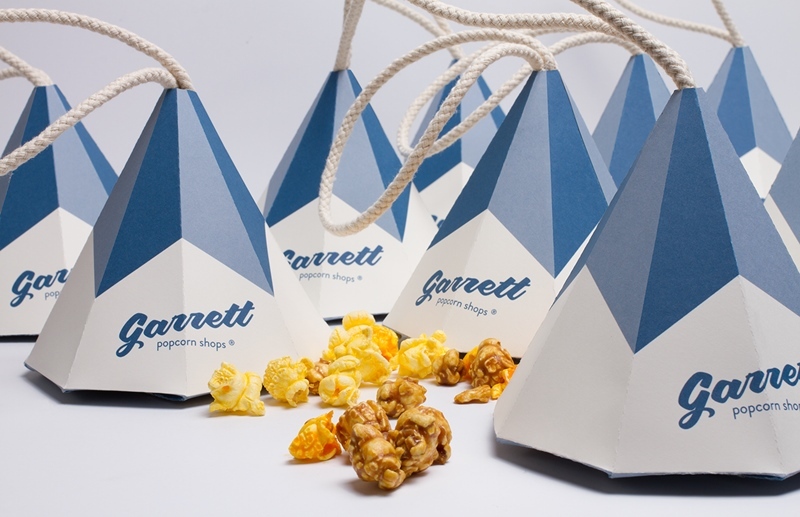 There are reasons why but before I start going into that let’s check out this cool cone popcorn packaging. The design is made by designer Jen Mulvihill as a student packaging project. The idea is that you get the popcorn in a cone. The cone has a small hole in the point of the cone where a rope sticks out. 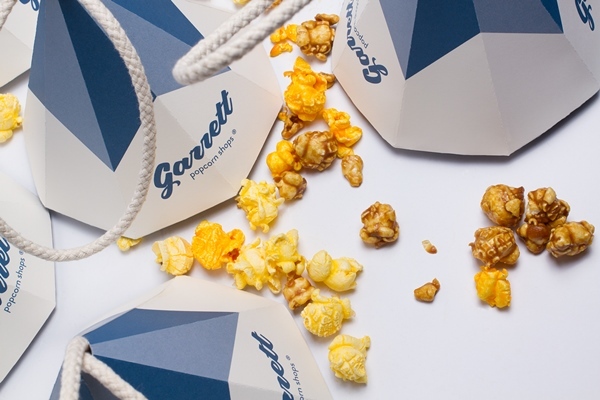 You turn the cone upside down, fill it with delicious popcorn. Fold it together and flip it upside down. The rope is then used as a handle and you can stroll to movie seat with a cone of popcorn swinging by your side. The great thing about this packaging is how it looks. The cone is folded which create a great shape. The blue and white colors also work great. Combine this with the rope and design on how to close the packaging and you’ve got yourself a winner. Sadly there are some things that is not so great about this packaging. First it will leak, the carrying design with the rope creates a leak in the packaging. This means that butter, salt or seasoning will leak from time to time. How do you stand it down once opened? This is another problem, its a cone popcorn packaging so you can’t really place it on a floor or table. That’s a big problem both at home and at the movies. The cost would also be way bigger than for a traditional packaging. The sad thing is that the standard box for popcorn at the movies is so good and cheap it is hard to compete. The same thing goes for the popcorn you take home. It’s hard to beat a bag that works. Still great work by Jen, keep it up! 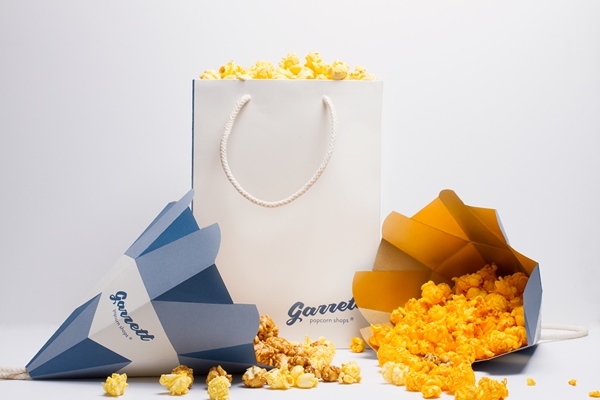 If you can’t get enough of popcorn packaging design I have a full list of great ones here. Enjoy!